At the Wednesday night, Elk Grove City Council meeting one city resident spoke during public comment on an issue that could cost drain millions of dollars from the city coffers. The comments were from Amar Shergill who urged the city council to reconsider their stance on holding their respective elections on an at-large basis from-district basis. The city of Elk Grove has been threatened with a lawsuit by attorney Kevin Shenkman contending that the current system is a violation of California Voters Rights Act and it should be changed to the more democratic by-district system. In the video posted below, Shergill walks the city council through his analysis of voting patterns in the City of Palmdale, California, who Shenkman successfully sued, and the Washington Unified School District (WUSD) in West Sacramento. The result of this, Shergill said was that Palmdale, who fought switching to the by-district form of representation, had to pay the plaintiffs litigation fees which cost taxpayers about $7 million (further documentation from WUSD can be viewed below the video). Likewise, after WUSD was threatened with a lawsuit, they ran the type of analysis Shergill spoke of and decided to forgo expensive litigation and voluntarily switch to by-district representation. 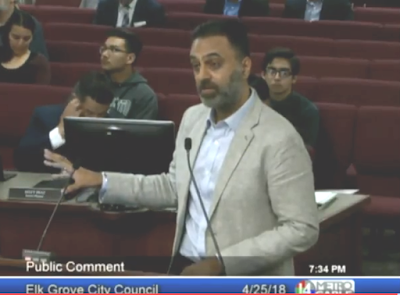 Shergill noted he has extended invitations to all of the council members to run the analysis, and thus save the city money, but has yet to be taken up on the offer. "Race is a factor, doesn't mean its racism, it just means we need to go to by-district voting if we don't want to pay $7 million," he concluded.